O2swim - A Personal and Passionate learning experience. Away from the noise and distractions encountered at the commercial swim schools, both O2swim’s instructors and swimmers can concentrate on the task at hand. With only 3 to 4 in a class, each swimmer gets more of the teachers attention and swimming time with amazing results that need to be seen to be believed. We also offer personal one on one teaching solutions for children and adults that may be nervous about being taught in a public environment, through to technique rectification for competitive swimmers and multi-sport athletes. Our philosophy ensures that swimming is a life skill, we teach our preschoolers to survive. We have a purpose built pool that caters for preschoolers to adults. Our swimmers are taught survival strategies in water that is out of standing depth. Personal survival skills. Our passion and attention to detail has seen some of our swimmers go on to become New Zealand age group champions and record breakers. Our aim is that every swimmer leaves us, with SNZ legal strokes. Our affiliation is to our local swimming club. Pukekohe Swim club is a friendly family orientated club that has programs for Mini squads through to Nationals Age Group and Open swimmers. The club operates a well rounded approach to swimming with team camps, overseas camps and holiday training available for all levels of swimmer. Alongside our private swimming lessons, we can provide teachers for your school lessons, or private home pool. Sue has 20 years experience as a swim teacher / coach, both in NZ and the UK. Schools - we can assist with lesson plans, sample lessons and term time programs. If you would like any further information please contact Sue. Due to O2swim’s popularity and high success rate there is limited space available. Contact us now to get on our waiting list. 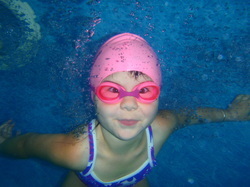 free underwater photos for all of our swimmers in term 4. Happy Memories. 02swim instructor and Pukekohe Swimming Club head coach Sue Cheyne, celebrates with her younger swimmers after having one her senior swimmers acheive a New Zealand age group record.